ATTENTION: In light of recent events, the BBQ competition has been postponed indefinitely. We will keep you updated on another date. Thank you for your support and we apologize for any inconvenience this might cause. 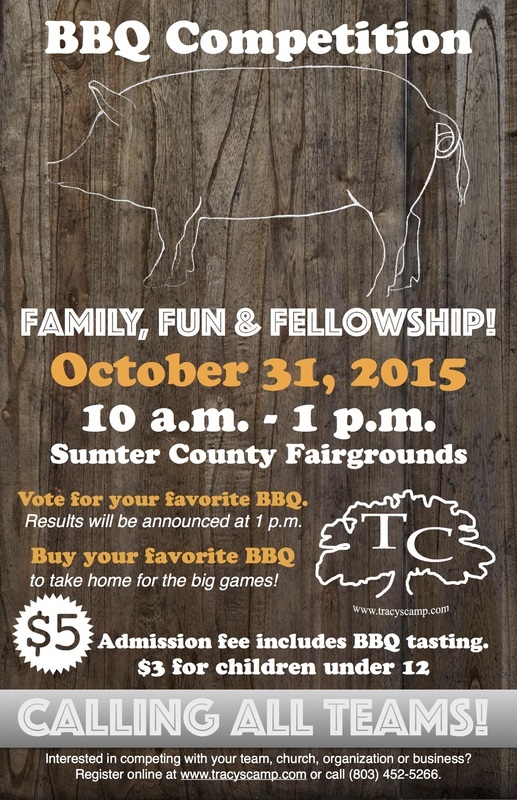 We would love to have your team compete in our 2015 BBQ Competition. There are two quick and easy steps to registering your team. (Please read all the rules and information below before you register.) First, have one member of your team complete the registration form below. Second, please pay the $250 entrance free. You can pay below or mail a check. All proceeds go to Tracy's Camp. The cost of competing in the contest is $250. The entrance fee is required in advance for you to compete. You can pay online securely using *PayPal or mail a check to P.O. Box 463, Pinewood, SC 29125. Make checks payable to Tracy's Camp. *You do not have to have a PayPal account to use this service.